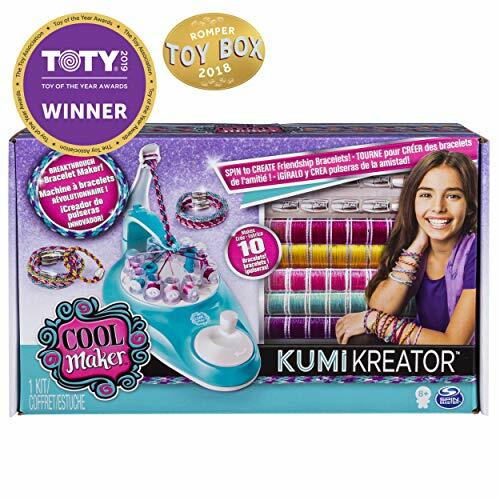 Cool Maker KumiKreator Friendship Bracelet Maker - HOT HOT HOT! 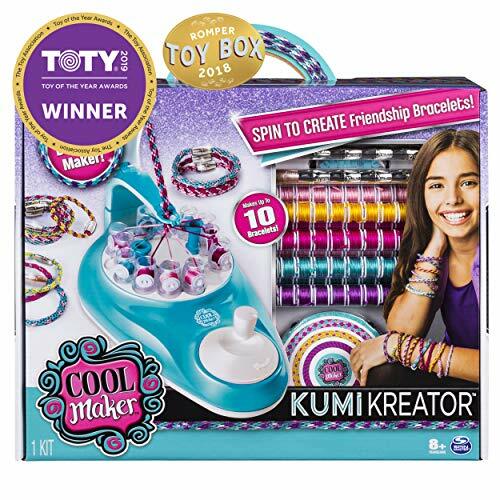 Cool Maker KumiKreator Friendship Bracelet Maker – HOT HOT HOT! 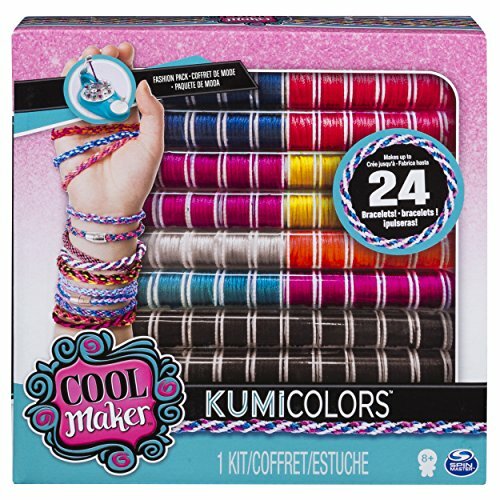 KumiKreator Cool Maker Kumi Kreator Friendship Bracelet Replacement Thread, Etc. EASILY SPIN TO CREATE: The Cool Maker KumiKreator is a breakthrough bracelet maker; it makes it so easy to create friendship bracelets without a single knot needed! Choose a bracelet design, load the machine with the colorful spools and spin to create! As you turn the handle, you'll be mesmerized as the spools dance around the machine, magically weaving your bracelet together in minutes! 88 PREMIUM SPOOLS: The KumiKreator's 88 pre-loaded colorful spools of string easily pop into the machine and make every bracelet look beautiful! Choose to create 8 or 12-strand bracelets from the design booklet for different bracelet looks. Stack, wrap and share your Kumi bracelets with your BFF's and mix and match with your outfits! The Cool Maker KumiKreator is a jewelry making kit for Cool Makers aged 8 and up. Spin to create beautiful friendship bracelets before your eyes and put the OMG in DIY! Cool Maker gives aspiring designers all the tools needed to make amazing creations they'll be proud to share. 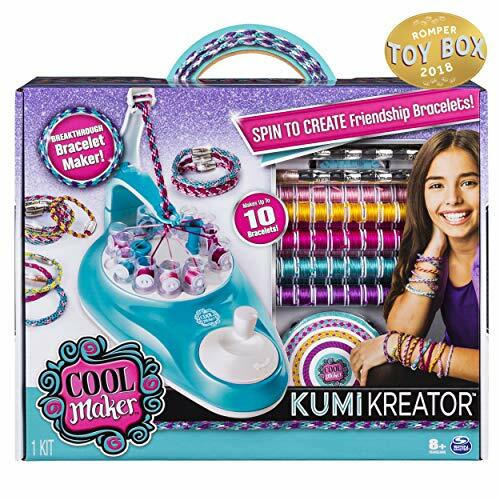 Spin to create: the Cool Maker kumikreator is a breakthrough bracelet Maker; it makes it so easy to create friendship bracelets without a single knot needed! choose a bracelet design from one of the two design booklets, load the machine (sold separately) with the colorful spools and spin to create! as you turn the handle, you'll be mesmerized as the spools dance around the machine, magically weaving your bracelet together in minutes! 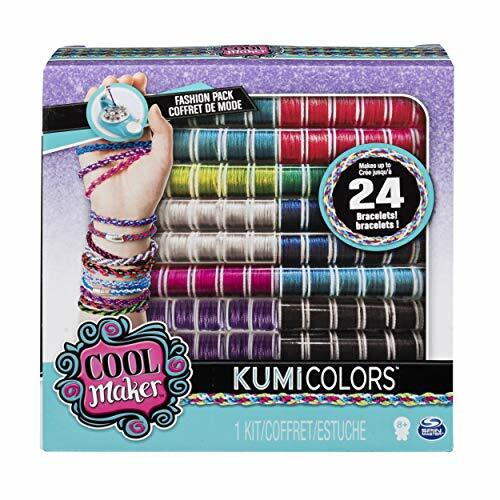 Make up to 24 bracelets: the Cool Maker kumi colors fantasy & neon's fashion pack includes everything you need to create up to 24 friendship bracelets using the kumikreator bracelet Maker (sold separately)! this fashion pack features 192 ready-to-use string spools in 10 different colors, two bracelet design booklets, stylish clasps to customize and more! 192 premium spools: the ' 192 pre-loaded spools of string easily pop into the kumikreator (sold separately) and make every bracelet look beautiful! choose to create 8 or 12-strand bracelets from the design booklets for different bracelet looks. Stack, wrap and share your kumi bracelets with your BFF and mix and match with your outfits! The Cool Maker kumi colors fantasy & neon's fashion pack is a jewelry making kit for cool makers aged 8 and up. 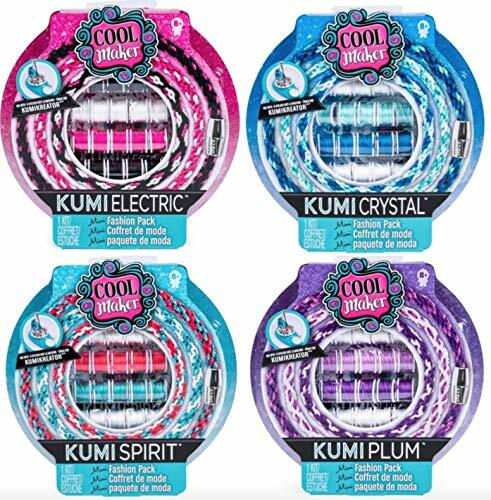 Put the OMG in DIY and spin to create beautiful friendship bracelets with the kumikreator and the kumi colors fashion packs! Cool Maker gives aspiring designers all the tools needed to make amazing creations they'll be proud to share. EASILY SPIN TO CREATE: The Cool Maker KumiKreator is a breakthrough bracelet maker; it makes it so easy to create friendship bracelets without a single knot needed! Choose a bracelet design, load the machine with the colourful spools and spin to create! Learn, make and share countless possibilities of friendship bracelets. Use the device to keep the materials organized. Great Christmas / Birthday Gift for 6-13+ year old teens. An art educational gift for kids who like to draw & be creative with their imagination. 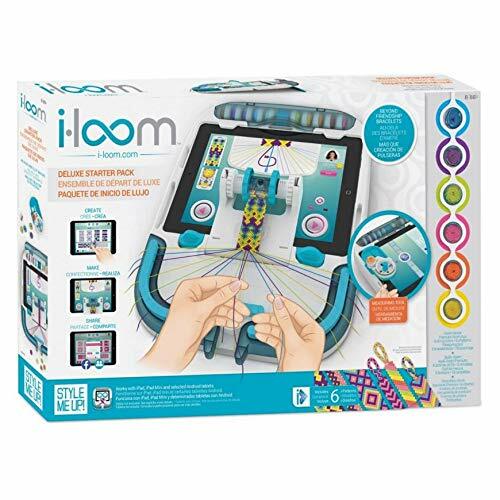 i-Loom Friendship Bracelet Making kit is on the go activity that is Perfect for road trips/plane travel. Hours of fun for kids in the car or airplane. Download the Premium i-loom App included in the set. Learn various knotting techniques & complete simple to complex projects. Contains: i-loom device, 6 spools of colored string, i-loom bracelet locks, 18 spool tags. Browse from a library of Patterns or create your own. ★ SUPER FUN, EASY TO ASSEMBLE CHARM BRACELETS ➽ Dream up your own designs with this jewelry craft kit. The flexible elastic wristbands have a simple adjustable snap closure. Simply slide the gorgeous charms on and off, switch things around and get creative! This bracelet maker kit is super easy and fun to do. The Kidtastic bracelet kit is one of the most popular gifts for 4-year-old girls and older. 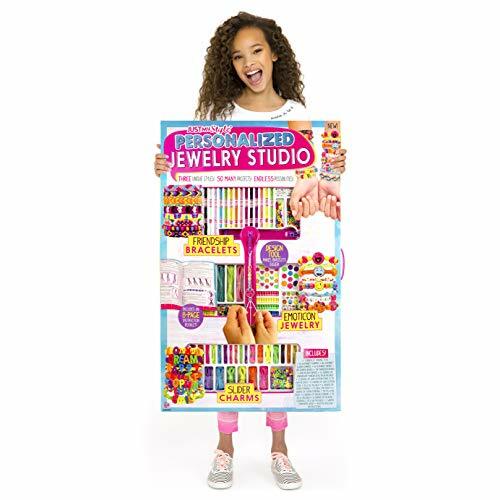 ★ PERFECT GIRLS BIRTHDAY PARTY, PLAYDATE OR SLEEPOVER ACTIVITY ➽This arts and crafts for girls set comes with 12 bracelets in a variety of funky colors! The Do - It Yourself / DIY jewelry bracelet set will keep 12 little girls busy and having a blast! Perfect for a craft birthday party, slumber party or playdates. 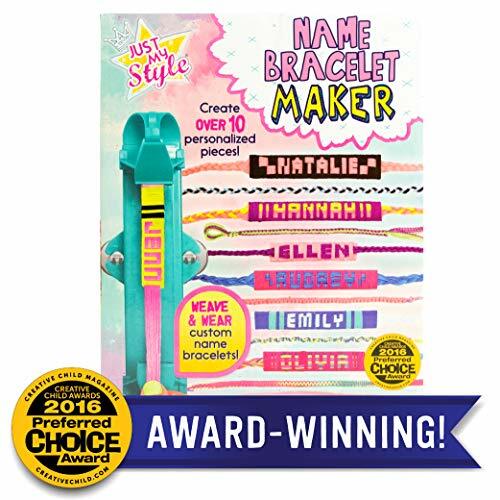 ★ SPELL IT OUT OR PERSONALIZE WITH YOUR OWN NAME ➽ Your daughter and her best friends can use their craft kit, to create their own kids best friend bracelets! Our bracelets kids craft set includes 156 Letters, 40 Icons Charms, so they can spell out each other's names or words like cool, funky, trendy, princess and more! 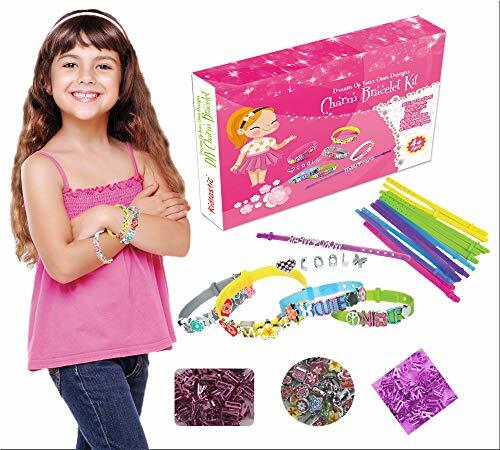 ★ PROMOTES FINE MOTOR SKILLS & IMAGINATION ➽The bracelet maker flexible band kit will teach girls spelling skills, reading skills, fine motor skills and promotes creativity and imagination! Too much time on iPads, tablets or phones won't help your child get ahead. Instead be that amazing parent and teach essential life skills through this fun DIY toy for girls. 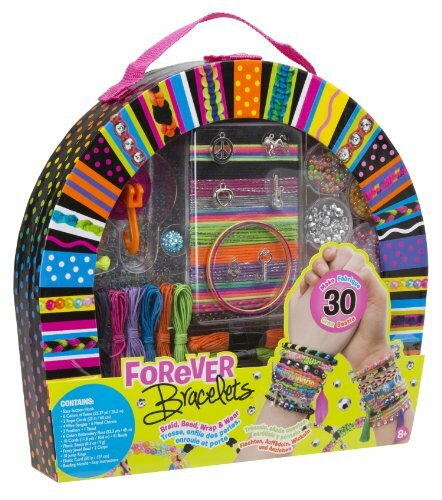 ★ 100% MONEY BACK GUARANTEE ➽ If for any reason you are unsatisfied with the Kidtastic craft friendship bracelet set / charm bracelet kit then we offer a 100% money back guarantee. Please be aware of knockoffs and imitations which are not tested for safety. Only buy original Kidtastic items. SPIN TO CREATE: The Cool Maker KumiKreator is a breakthrough bracelet maker; it makes it so easy to create friendship bracelets without a single knot needed! Choose a bracelet design from the KumiFantasy design booklet, load the machine (sold separately) with the colorful spools and spin to create! As you turn the handle, you'll be mesmerized as the spools dance around the machine, magically weaving your bracelet together in minutes! 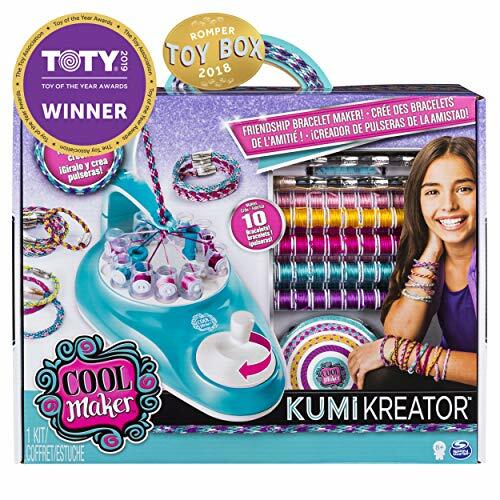 MAKE UP TO 12 BRACELETS: The Cool Maker KumiFantasy Fashion Pack includes everything you need to create up to 12 friendship bracelets using the KumiKreator bracelet maker (sold separately)! KumiFantasy features 96 ready-to-use string spools in 5 fantasy-inspired colors, a bracelet design booklet, stylish clasps to customize and more! 96 PREMIUM SPOOLS: The KumiFantasy Fashion Pack's 96 pre-loaded spools of string easily pop into the KumiKreator (sold separately) and make every bracelet look beautiful! Choose to create 8 or 12-strand bracelets from the design booklet for different bracelet looks. Stack, wrap and share your KumiFantasy bracelets with your BFF's and mix and match with your outfits! The Cool Maker KumiFantasy Fashion Pack is a jewelry making kit for Cool Makers aged 8 and up. Put the OMG in DIY and spin to create beautiful friendship bracelets with the KumiKreator and the KumiFantasy Fashion Pack! Cool Maker gives aspiring designers all the tools needed to make amazing creations they'll be proud to share. SPIN TO CREATE: The Cool Maker KumiKreator is a breakthrough bracelet maker; it makes it so easy to create friendship bracelets without a single knot needed! Choose a bracelet design from the KumiCools design booklet, load the machine (sold separately) with the colorful spools and spin to create! As you turn the handle, you'll be mesmerized as the spools dance around the machine, magically weaving your bracelet together in minutes! 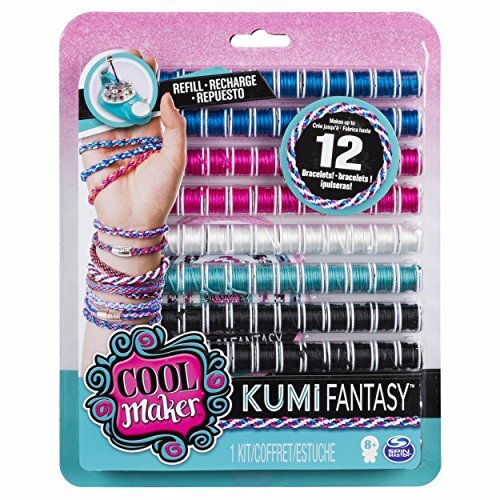 MAKE UP TO 12 BRACELETS: The Cool Maker KumiCools Fashion Pack includes everything you need to create up to 12 friendship bracelets using the KumiKreator bracelet maker (sold separately)! KumiCools features 96 ready-to-use string spools in 5 super cool tones, a bracelet design booklet, stylish clasps to customize and more! 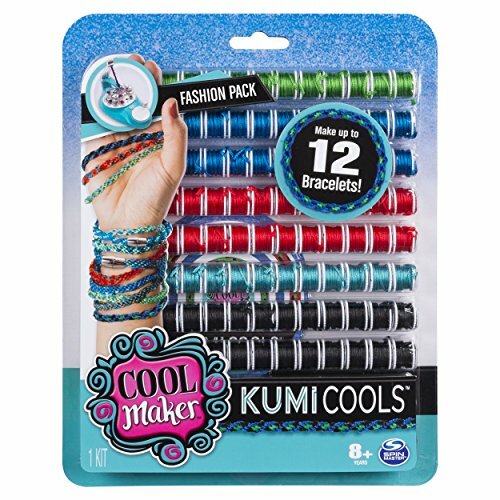 96 PREMIUM SPOOLS: The KumiCools Fashion Pack's 96 pre-loaded spools of string easily pop into the KumiKreator (sold separately) and make every bracelet look beautiful! Choose to create 8 or 12-strand bracelets from the design booklet for different bracelet looks. Stack, wrap and share your KumiCools bracelets with your BFF's and mix and match with your outfits! The Cool Maker KumiCools Fashion Pack is a jewelry making kit for Cool Makers aged 8 and up. Put the OMG in DIY and spin to create beautiful friendship bracelets with the KumiKreator and the KumiCools Fashion Pack! Cool Maker gives aspiring designers all the tools needed to make amazing creations they'll be proud to share. 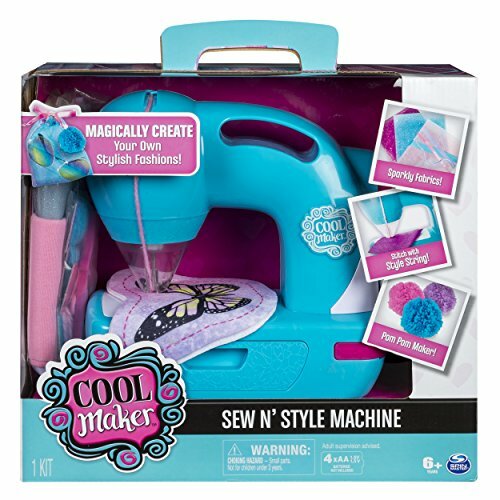 SEW STYLISH FASHIONS: Sew your own stylish fashions with the Cool Maker Sew N' Style Machine! Safe and easy to use, the Sew N' Style Machine let you stitch and create using sparkly fabrics and bright prints! MAKE AMAZING PROJECTS: This sewing kit comes with everything you need to make amazing projects! Use the included materials to create your own plush unicorn, glitter pouch and more! CUSTOMIZE WITH POM-POMS: Make your designs distinctly yours! Use the pom-pom maker attachment to create cute pom-poms, then add string, ribbons and more to your creations! ✨Over 600 beads: create custom transfer beads, spell out names, phrases and words with alphabet beads and add vibrant pops of color with neon accent beads! ✂️ learn 11 techniques: follow along with the 8-page instruction booklet to learn how to make 11 different kinds of bracelets including macrame, braids, beaded bracelets and more! Easy-to-use design tool: make better bracelets faster with the included bracelet making tool! No-bake Cool Baker treats are so easy & fun to make: just add water, blend in your Magic Mixer Maker (sold separately) & refrigerate for 15 minutes. No Oven Required. Personalize your Cool Baker tasty treats by spreading purple vanilla icing and pink sugar sprinkles on each Chocolate Chip Cookie in unique patterns. Refill pack requires tray, cookie cutters & accessories, available in the Cool Baker Cookies Accessories set. Magic Mixer Maker also sold separately. Cool Baker Chocolate Chip Cookies Mix Refill Pack is for ages 6+, with 1 cookie mix, 1 icing mix, 1 sprinkles pouch to make approx. 3 no-bake Cookies.